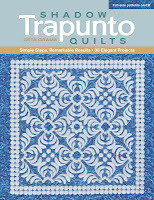 Last week I purchased Geta Grama's book, "Shadow Trapunto Quilts" (find it here). Oh... I need more hours in a day! I have been putting off trying trapunto, but now I cannot resist it any longer, particularly shadow trapunto. First, go to Geta's blog (click here) to see her beautiful work. She has an engineering background, is very adept with EQ (Electric Quilt) software, and very creative. Geta is Romanian but both the website and the blog are in English. 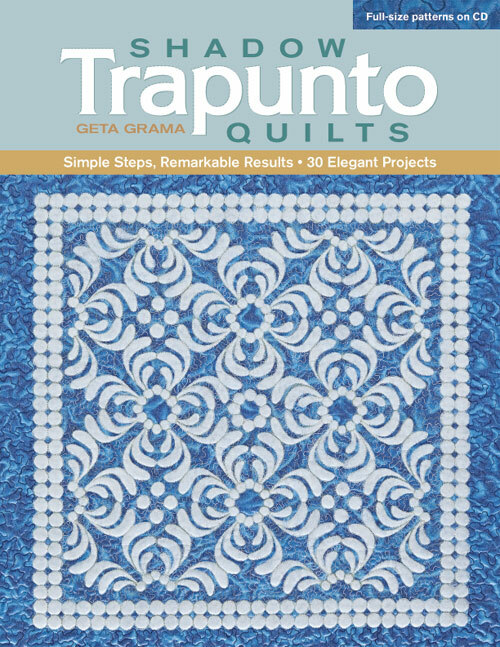 In her book, published in 2012, Geta presents a tutorial on how to do shadow trapunto, which involves printing a pattern on a piece of paper, laying that paper onto a piece of organza, then onto high loft batting. Sew through the layers following the pattern, cut the batting around the seam, remove paper, and layer this work onto batting and backing. Finally, quilt it. Her designs are intricate (but doable) and are included in a CD which comes with the book. The projects are easy to follow and the photographs are very detailed. I enjoy following her blog, as she makes the most amazing quilts (the Houston International Quilt Show loves her!). She also designs cool quilt and bag patterns. Geta loves everything colorful and seems to always be following anything related to rainbow colors! Check out her book - I know you will be inspired! Keep coming back to my blog, as I will soon surprise you with a shadow trapunto project of my own! Thank you for the review, Denise. I am looking forward to see your shadow trapunto piece. Happy Sewing! Olá!Está na minha lista de QUERO APRENDER,Será?...Lembro de uma vizinha fazendo isso com algodão(se lembra dos pacotes marinho?Dona Amélia ia escamando o algodão,e passava o ferro (brasas)para achatá-lo ficava igual um feltro finíssimo. Fazia vestidos de noiva,meu Deus...era lindo. Faça uma tentativa assim,com Organsa ou Organdi.Sei que sou abusada...Beijos e Bençãos. I'll be watching to see how you come along with this new form of quilting. I may want to give it a try myself sometime!